The Primitive Stars Pillow has three mustard plaid primitive stars appliqued on a black felt base and whip stitched in tan for accent. 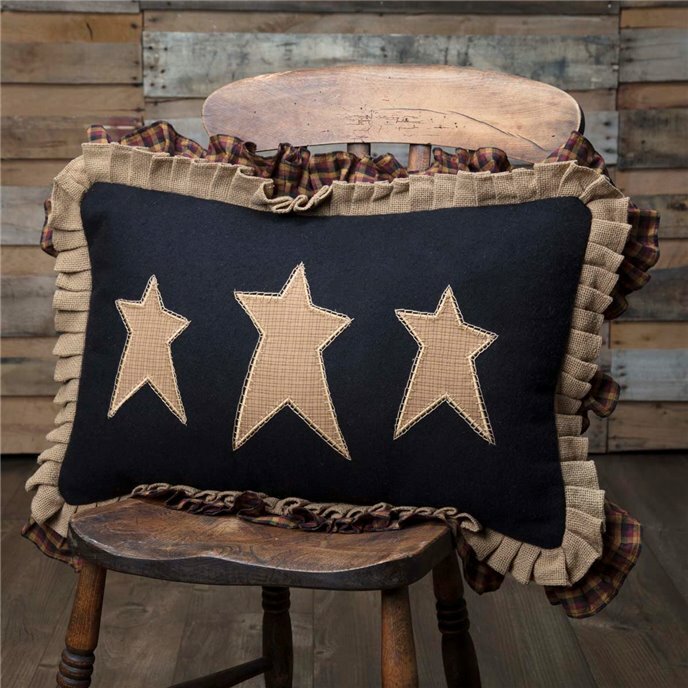 The edges are trimmed with a double ruffle in natural burlap and a burgundy, tan, and black check fabric. The back of the pillow is burgundy, tan, and black check fabric and has 2 tie closures with a 3" overlap to conceal the pillow insert. 14"L x 22"H. Cotton and felt shell, 100% polyester fill. Shell and fill spot clean only. This item is imported. Please note, colors may appear differently in different resolutions and on different computers. Manufacturer's UPC code is 840528159886.